1) IKEA! – On Tuesday, I had the opportunity to go to a fun blogger luncheon for Folgers (more on that in a couple of days). Miss H was at my mom’s taking a nap so I had a whole afternoon to myself. I decided since I had to pass IKEA on the way home I would stop! It was raining, so no one was there. It was awesome! I ended up getting these long sleeve smocks that a few people suggested for Miss H and a new ice cream scoop. I was getting ideas for her bathroom as well. I’m also totally in love with those buffalo check curtains. I’m trying to figure out how to make those work in my house. I’ve seen them twice now and I keep going back to them. I think it’s meant to be. 2) Full Moon – Anyone else’s kiddos just nuts this week? Miss H was totally off her game for a couple of days and we’re going to blame the full moon. I had to carry her out of Moms Club Playgroup on Wednesday and it was just a bad day overall. Thursday she was so much better and I had my happy little lady back. But man, it was a rough couple of days this week. 3) Llama Selfie – If you recall my epic Goat Selfie a couple of weeks ago, I present to you the Llama Selfie Shirt. I about died laughing when I saw it last week and it came yesterday. It’s pretty fantastic. I love that J Crew has free shipping on all their kids clothes. It makes me happy. Shipping in a non-negotiable for me. If I have to pay, I don’t play. 4) Pinterest Told Me To – if you aren’t following her, you need to! I ended up getting THE TOP from Loft and I love it. It sold out already, but you have to follow her for awesome deals and trends. I’ve gotten quite a few things based on her recommendations. 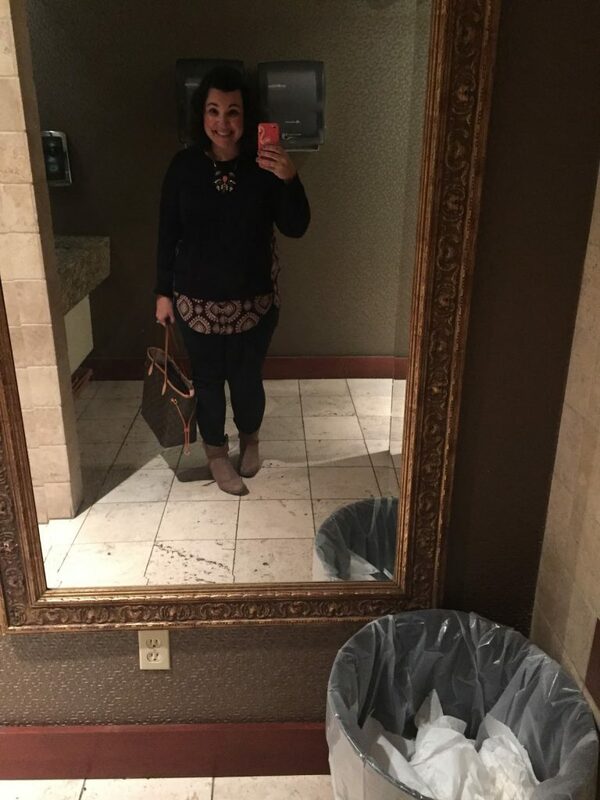 Ignore my awful bathroom selfie – but I loved this outfit. I had a J Crew necklace that worked perfectly! 5) Halloween Jammies – So Miss H didn’t want to pose for me when I put her jammies on this week, but how I love Skeleton Jammies. These are from Gap Outlet and they are adorable. I ended up getting them off season for $5. Because really, jammies aren’t trendy, right? I already picked up a pair for next year too! She’s quite the fashionista! We were just at IKEA too, love that place! Isn't it the best? So much inspiration and ideas! Oh man! Ikea is the BEST. Anytime I see someone at Ikea it puts me in the mood to go to Ikea too 😉 also LOVE your little one's jammies. My daughter had those same ones last year and I wish they still fit! I always buy off season, so I think I'm going to find both sizes this year. I love Halloween jammies! Have a great weekend! Oh why is that llama shirt only for kids??? It's so cute and I would wear it myself! I'm almost tempted to order the next size up too. I have a feeling it will be a popular tee in rotation! I'm so jealous that you got a trip to IKEA without a baby! I'm hoping to plan something like that soon too! I love IKEA and wandering around and looking at all their setups… but with a little one it's a little harder! Happy weekend! It was heaven! We just got an IKEA last month is STL, so it's still a pretty popular place to be! Lovin' her jammies!! Glad I came across your blog! Thanks for stopping by! I had a deep love of jammies and we may have WAY too many! Have a great Halloween! I haven't been to IKEA since before Parker was born. I really want to get to one soon though because they have a bunch of cool wooden toys. Great pajamas! They look just like the pair Parker has from Old Navy. I need to start shopping off season like you and planning ahead for next year! I just have no idea how big she'll be! I'm so jealous you went to Ikea! I still haven't made it there. I'm slightly afraid and totally intimidated. But more importantly, when are we going to barre class? I've got my Groupon and am totally ready for the pain! Yes kiddos have been off their rockers – its a full moon, its halloween, we had parties today, the changing weather and the time change. Aye carumba! Sheaffer is amazing! How is it she's super cute, funny and a great shopper?! Blessed I guess 😉 Great deal on the jammies, Gap has the best sales! I get in more trouble by being a cardholder, I swear. Love this post. I'm a new follower & a fellow STL blogger. I have not yet ventured to IKEA, and as a new homeowner, I really need to (or maybe my bank accounts is grateful I haven't). Cheers!